Two years ago, Canadian Prime Minister Justin Trudeau announced a set of aggressive policies to reduce his country’s greenhouse gas emissions, centered on a nationwide price on carbon. As that price is about to take effect, growing opposition has put Trudeau on the defensive and has provincial governments rolling back other measures, raising questions about the appetite of this oil-exporting country to tackle climate change. "We’re seeing one step forward, one step back," Keith Stewart, senior energy strategist for Greenpeace Canada, said in an interview. "They’re trying to craft a path which doesn’t upset anyone too much." The growing backlash to Canada’s climate push reflects a number of changes, experts say. Those include widespread anger in Ontario as electricity prices soared in recent years, driven in part by a shift to renewables; worries about the economy amid a brewing trade war; and the rollback of U.S. climate policies under President Donald Trump, which could draw energy investment away from Canada. But perhaps the biggest obstacle has been political. Conservatives have focused on the government’s climate policies to rally their supporters. Support for Trudeau’s Liberal Party has fallen, putting it in a rough tie with the rival Conservative Party. Trudeau’s chief opponent in next year’s federal election, Conservative Party leader Andrew Scheer, has said one of the first things he will do as prime minister is eliminate the carbon tax. Stephen Harper, the Conservative who governed Canada from 2006 to 2015, also sees a political opening. 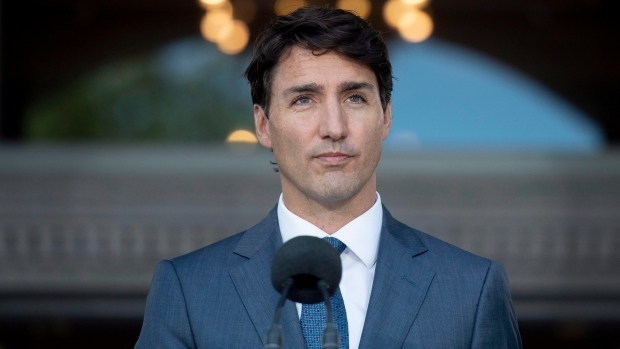 “Let the other guys do a carbon tax because we can all win the next federal and provincial elections on that issue alone,” he said in a recent closed-door speech, as reported by Maclean’s magazine. “It is incredibly unpopular with conservatives, who currently have the wind at their back,” said David McLaughlin, a former climate adviser to the premier of Manitoba who is now director of climate change for the International Institute for Sustainable Development in Winnipeg. Trudeau’s opponents, he said, "have nailed their colors to the anti-carbon-tax masthead." Catherine McKenna, Canada’s minister of environment and climate change, said in an interview that the dangers associated with global warming meant her government had to cut emissions. She said the government would proceed with its plan in the face of provincial opposition. "It is a huge risk to cities, a huge risk to businesses to not take action," McKenna said. "We want to create jobs, we want to grow the economy and we want to tackle climate change." Canada emits more greenhouse gas per person than almost any other country. That’s partly the result of geography: Canada’s cold climate and vast expanses require plenty of energy to heat homes and fuel cars and trucks. But it also reflects the country’s energy-intensive oil and gas industry -- a key part of Canada’s economy. That industry is centered in Western Canada, which has resisted federal policies to reduce emissions. To address those concerns, Trudeau in 2016 announced what he described a flexible, "pan-Canadian framework" to carbon pricing, in which provinces could choose the system that best fit their economies. Those options included a so-called cap-and-trade approach, in which the province sets a limit on emissions and lets companies buy and sell credits. Ontario and Quebec had already adopted such a system, linked to California’s cap-and-trade market. Or provinces could impose a carbon tax, or some mix of the two. If the federal government decides that a province’s effective price on carbon was too low, Trudeau said he would impose a tax, starting at $10 per ton this year and rising to $50 by 2022. His government has already pushed back by one year the imposition of that tax; it is now set to take effect in January. Provinces have until September to submit their plans for federal approval. As that deadline nears, the opposition has grown. Saskatchewan, the country’s largest oil and gas producer after Alberta, launched a legal challenge in April to stop the policy, arguing that provinces, not the federal government, have authority over natural resources. "The federal government does not have the legal ability to second-guess how provinces have exercised their jurisdiction," Trelle Kolojay, a spokeswoman for Saskatchewan Premier Scott Moe, said by email. She said the federal carbon tax would shrink the province’s economy, "with little effect on emissions." Eric Adams, a law professor at the University of Alberta, said he would be surprised if Saskatchewan prevailed. But he said that if the province appeals to Canada’s Supreme Court, it would put pressure on the federal government to further delay the implementation of the tax until that court ruled. "Conservative governments and politicians are using this as a wedge issue," Dave Sawyer, an environmental economist who has advised several provinces on their climate policies, said in an interview. "It’s working." Canada’s oil and gas industry supports Saskatchewan’s argument. "We think the provinces are in the best position to decide what the right suite of policies is," Terry Abel, executive vice president for operations and climate at the Canadian Association of Petroleum Producers, said in a phone interview. Saskatchewan is also gaining support from other provinces. Doug Ford, the newly elected premier Ontario and brother of the late Toronto mayor Rob Ford, this month rescinded his province’s cap-and-trade plan, as well as canceling contracts for wind and solar power that have contributed to rising electricity rates. Ford announced Thursday he will join Saskatchewan’s legal challenge. His minister of the environment -- a title from which Ford recently stripped the words "and climate change" -- traded barbs with McKenna after their first meeting this week. Ontario will introduce a new climate plan of its own, Phillips said. He declined to say what that plan would entail, except to note that it won’t include a carbon tax. Alberta could be next. The province is set to hold elections next spring; the overwhelming favorite to win those elections, United Conservative Party Leader Jason Kenney, has said he will dramatically reduce the province’s current carbon tax. "Canadians are voicing their opposition to the carbon tax at the ballot box," Kenney said in a statement. "The Prime Minister should actually listen to Canadians as opposed to ramming an increasingly unpopular tax down their throats." Trudeau tried to ease concerns about the viability of Canada’s oil industry, announcing in May that his government would buy a major pipeline project from Houston’s Kinder Morgan, Inc. That pipeline, which Kinder Morgan had threatened to abandon because of regulatory delays, would transport crude from Alberta’s oil sands for export from Canada’s Pacific coast. The announcement drew cautious support from industry. "We have to get our oil to tide water," said Ryan Greer, director of transportation and infrastructure policy for the Canadian Chamber of Commerce. But Greer said his members remain concerned about the costs and uncertainty associated with Trudeau’s actions on climate. Meanwhile, Trudeau’s decision to buy the pipeline has left environmentalists worried that his government isn’t willing to weather the political attacks that come with meaningful cuts to emissions. "What is politically reasonable, coming down the middle, can’t do what is scientifically required," Greenpeace’s Stewart said. "Climate leaders don’t build pipelines." McKenna, the Canadian environment minister, defended her government’s support for boosting Alberta oil exports. "Transitions take time," she said. "And I’m the environment minster for everyone."